Delicious fudge all decked out for the holiday! 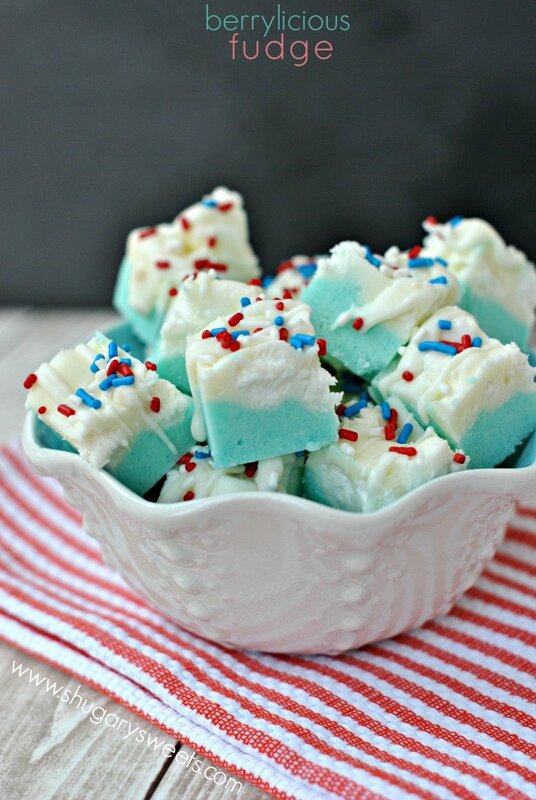 Patriotic Berrylicious Fudge needs to be at your 4th of July party! I’m sure you’re not surprised that I’ve made fudge again! It’s quite possibly one of my favorite treats to make. Well, along with marshmallow krispie treats. Do you know what the common denominator is in these two desserts? And not any marshmallows….Kraft JET-PUFFED Marshmallows. Creating the perfect fudge has a lot to do with starting with perfect ingredients. Ingredients you know and trust will give good results EVERY. SINGLE. TIME. That’s how I feel about Kraft JET-PUFFED Marshmallows. They stay soft and chewy in your krispie treats. And in fudge they help give it the soft texture you love to sink your teeth into! In today’s fudge recipe I used several of my favorite Kraft JET-PUFFED products. 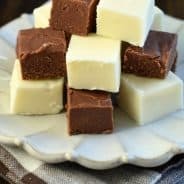 I used the Marshmallow Creme in the base of this fudge recipe. But I also added some miniature marshmallows to the recipe. These gave the fudge a super soft place for your teeth to land as you take a bite! 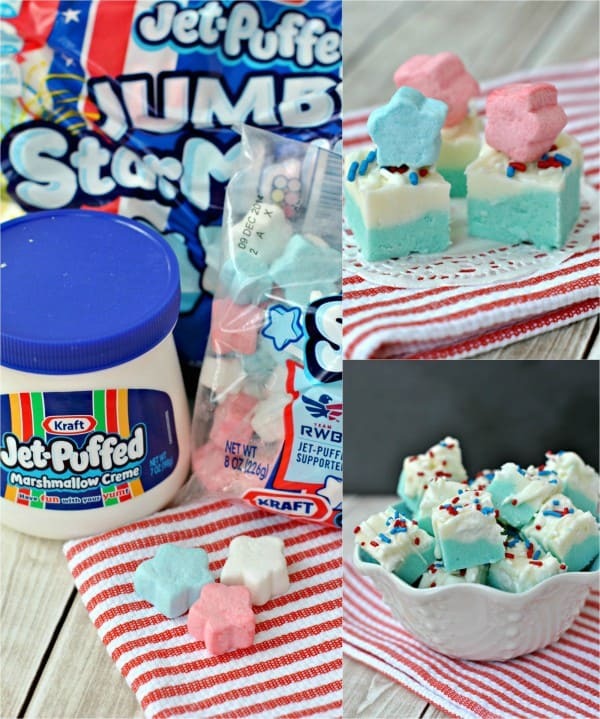 And if that wasn’t enough marshmallows, each piece of fudge is garnished with an adorable Kraft JET-PUFFED StarMallows marshmallow. Of course sprinkles were necessary too! If you happen to be stumbling across today’s recipe in the middle of winter….these would be adorable for a baby shower too! 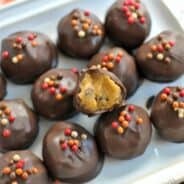 Once you know how to make fudge, you can make it for any occasion! In a large mixing bowl, add white chocolate morsels and marshmallow creme. Set aside. Line an 8inch square baking dish with parchment paper. Set aside. In a large saucepan over medium high heat, combine granulated sugar, heavy cream, butter and salt. Mix ingredients with a spatula and continue to combine until mixture comes to a boil. Once mixture comes to a rolling boil, continue to stir constantly. Boil for a full 4 minutes. Remove from heat and pour over ingredients in mixing bowl. Using an electric mixer with whisk attachment, blend until smooth (about 1 minute). Remove about 1/3 of mixture and scoop it into a small bowl. To remaining fudge in mixing bowl, add gelatin mix and whisk until color is fully blended. Pour into prepared baking dish. To the remaining fudge mixture, fold in miniature marshmallows. Pour white fudge mixture over blue fudge. Place in refrigerator and cool for a about 3-4 hours, until set. Remove fudge from baking dish by lifting the parchment paper. Peel parchment off. Cut fudge into bite sized pieces, separating them slightly. Melt vanilla candy coating according to package directions. Pour candy coating into a small plastic bag and snip off the corner. Drizzle over bites of fudge. Immediately press Starmallow onto the top. Add sprinkles if desired. Store fudge in airtight container in refrigerator for up to two weeks. ENJOY! Disclaimer: Kraft Foods provided me with product for use in this post, and compensated me to create a recipe. The views and opinions expressed on this blog are purely my own. This fudge is gorgeous! And cute. I can see this going first at a July 4th party! 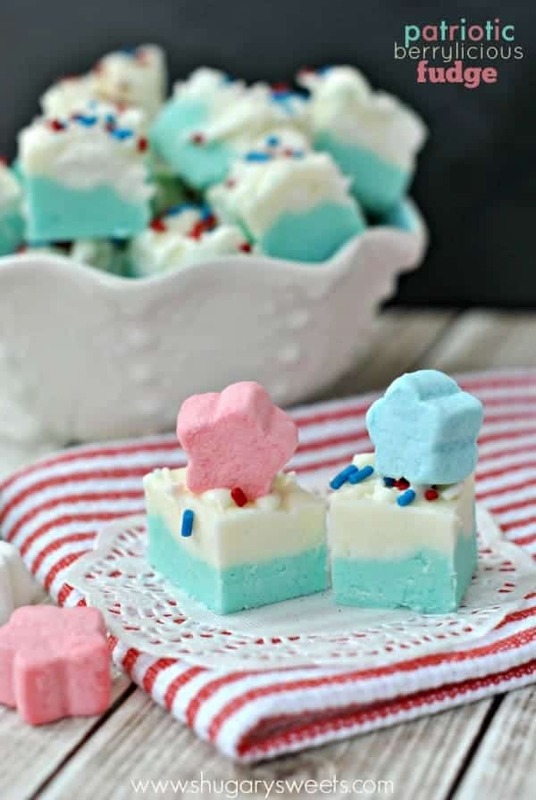 I don’t think I can wait until next week to make this fudge..it is SO ADORBS! I can’t even handle it. But, I think my belly can! Pinned! This is cutest thing I’ve ever seen!! I can’t wait to bring this to a 4th of July party! Perfect for the 4th of July! These are adorable, pinned! I am in love with this fudge, Aimee! So cute and just perfect for the 4th! What a fun candy for July 4th! These are so unbelievably cute. They would be a huge hit at a July 4th party. Love this! Not only am I crazy about fudge, I love the cute factor in this recipe too! 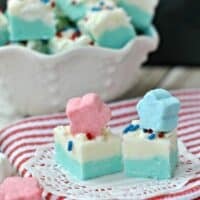 I love the colors and creative ways to celebrate Fourth of July! These look so cute and amazing! I might just have to give these a try for the 4th! Such a fun and festive fudge!!! You know how much I adore all your cute fudge ideas!!! Love the extra marshmallows in and on this one!!! This is so stinking fun! This fudge is so cute! Hahaha. I love being a queen!! Thanks for pinning! 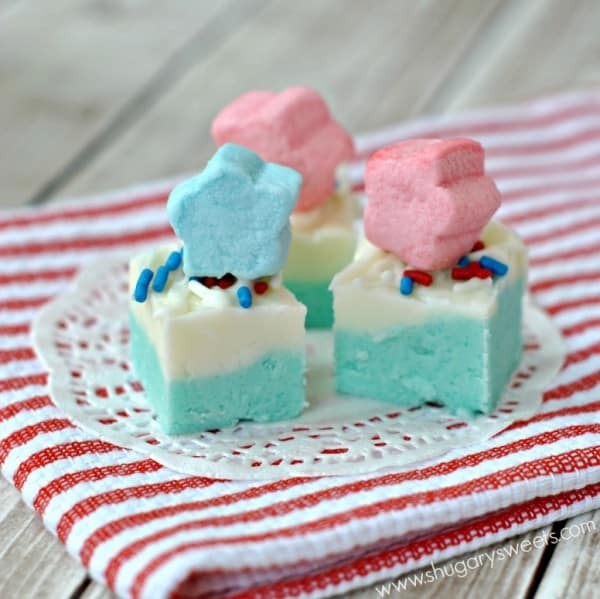 These are adorable treats for the 4th of July! Great for birthday parties, too – clever! 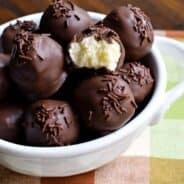 The berry flavor sounds amazing, I have never made fudge before, better get on it! Would this work with cherry/strawberry jello? 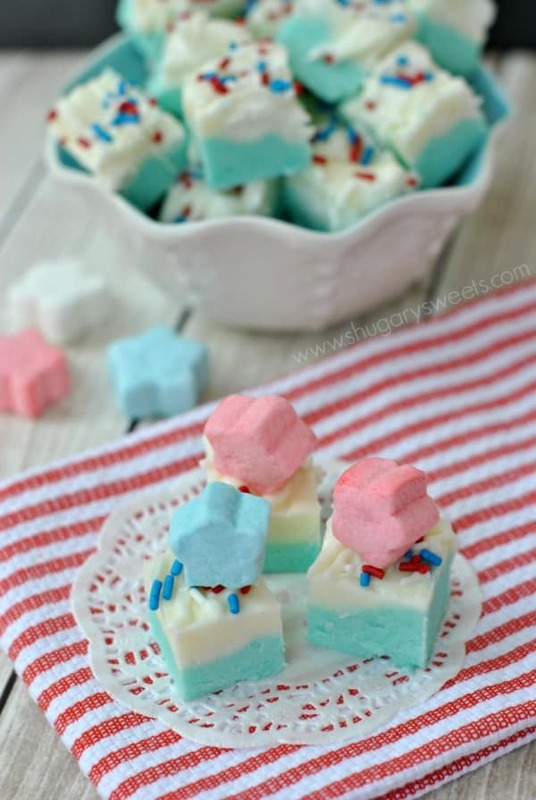 There’s a baby shower for my sister-in-law in 2 weeks and she is having a girl and I think this would be ADORABLE (and one of the easier fudge recipes I’ve seen…no need for a candy thermometer! ).